Leaves crunching underfoot in autumn. Spring’s leafy pageant of music, color and scent. The deep silence of the snow-covered forest. A walk in the woods thrills our senses and feeds our souls. The Old Northwest Territory’s forests have been altered drastically over the past century, but a number of havens are being protected and managed so that wildlife and humans can still reap the benefits of our distinctive woodland habitats. The woodlands of contemporary northwestern Illinois and southern Wisconsin bear little resemblance to the original forests encountered by settlers here in the 1800s. When early European-American settlers arrived in northern Illinois in the 1830s, they encountered a landscape that might best be described as a mosaic of prairies, wetlands and timbered lands. These timbered lands varied greatly from one place to another in the kinds and numbers of trees they supported. “Landscape position, terrain and soil type played major roles in determining what type of timbered land one would encounter,” explains John C. Nelson, of the Illinois Nature Preserves Commission (INPC). For example, closed-canopy forests of flood-tolerant trees dominated areas along the major river systems of the region. These forests were rich in diversity of tree species and the fertile soils helped to maintain a rather dense forest condition. Along the banks of the Rock and Pecatonica rivers grew lush bottomland forests that supplied the wood for the Rockford furniture industry during the late 1800s and early 1900s. Hardwood communities thrived on the fertile soils found on higher terraces located out of reach of regular river flooding. Dense upland forests were restricted to areas of rather steep terrain, deep ravines and other places where fire disturbance was minimal. The rugged Driftless region of Jo Daviess County, Ill., supported more upland forests than any other part of northern Illinois. Pre-settlement, Jo Daviess County was about 80 percent woodland, Winnebago 40 percent and Boone 45 percent. In gentler areas of rolling Northwest Territory topography, true woodlands and savannas could be found in great abundance. “Settlers encountered vast prairies and wetlands that were essentially treeless plains,” Nelson explains. Trees had difficulty growing here due to very wet conditions and frequent fires. These oak savannas comprised the majority of woodland habitat here in pre-settlement times. Although it once was one of the most common vegetation types throughout the Midwest, the oak savanna is exceedingly rare today. The Wisconsin Department of Natural Resources (WDNR) estimates that only about 0.01 percent of the original oak savanna still remains. Southern Wisconsin’s original natural communities were a mix of hardwood forest interspersed with small areas of oak savanna. “The approximate line dividing Wisconsin’s northern conifer-hardwood forest from the southern hardwood forest is a meandering line, starting at the center of Sheyboygan County and ending in the Indianhead country of Burnett and Polk Counties,” says Daniel Boehlke, horticulturalist at Frenz Garden Center in Mequon, Wis.
On even higher ground, a little further away from the prairies, were the true woodlands of northern Illinois. They contained more trees than the open savanna, but fewer trees than the closed forests. The original woodlands probably were very inviting, because they were somewhat open and accessible, and the terrain was more rolling. In the springtime, these woodlands put on an impressive display of color because of the blooming ephemerals. These relatively open forests were dominated by mixed stands of oak, hickory and other hardwood trees. Plant and animal life in the forests adapted, over time, to the conditions created by the large, light-filtering trees of the forest canopy. Forest organisms became at least partially dependent upon trees for everything from shelter to soil nutrient balance. In particular, the fruits and nuts produced by trees were used by many forest wildlife species as a primary food source. Since that time, the woodlands of our region have seen tremendous changes. Northern Illinois’ woodlands have decreased by 80 percent since settlers cleared most of this region for farming. The various woodland habitats that once defined this region are now limited to a few relicts that provide the last refuges for the insects, birds and animals that depend upon them. Not only has the number of forested acres generally diminished over the decades, but the biodiversity of the forested communities has suffered. Unfragmented, landscape-scale forest is of vital importance to a long list of plants and animals. The largest threats to our remaining forests are fragmentation and clearing for farming and development, both commercial and residential. Greg Keilback, environmental educator at Severson Dells Nature Center, says size is as important as ecological quality to the woodland’s ability to support native plant and animal communities. The ground nesting warbler, for example, must have large tracts of forest ecosystem to successfully nest. Edge effect is the term used to describe a small natural area’s vulnerability to negative impacts that assault its extensive outer borders. Forest fragmentation negatively impacts the long-term sustainability of plant and animal communities. Migratory pathways, food sources and breeding grounds are lost or divided. Fragmentation harms many woodland birds, by making them more susceptible to predators like jays, crows, raccoons and cats – creatures not typically abundant in extensive forests. In their natural evolution, our oak woodlands were large. Even those oak groves surrounded by prairie tended to be extensive. Large woodlands provide a wide range of habitats for plants and animals and can be resilient. Conversely, small woodlands provide relatively little habitat and are very susceptible to disease, storms and other disturbances. A tornado could wipe out a 20-acre woodland, but if that woodland were 500 acres or more, such a disturbance would likely add to the diversity of the woodland ecosystem. Large tracts of upland oak woodlands, 100-plus acres, are exceedingly rare. “Unless steps are taken to protect and restore our native oak savannas and woodlands, most of those that remain will be lost due to neglect – within our lifetime,” Nelson predicts. Buffering and connecting forested tracts are two of the most valuable strategies for making our remaining forest lands sustainable. An excellent example of conservation agencies working together to connect forested tracts is the Severson Dells/Coleman Dells/Hall Creek Preserve complex. These connected forest communities are wonderful examples of closed canopy forest systems. Although owned and managed by multiple agencies and straddling Winnebago and Ogle counties, this is one of the largest continuous upland forest tracts in north-central Illinois. “A major challenge with oak forests is insufficient oak regeneration due to fire suppression,” says Mike Groves, director of natural resources for the Winnebago County Forest Preserve District (WCFPD). Lack of wildfires in modern times has fostered invasions of sugar maples and weedy plants such as bush honeysuckle, buckthorn and garlic mustard. To preserve the integrity of woodlands, forest restoration ecologists use fire to fend off invading species. The District’s trained crews administer controlled burns on hundreds of acres of forest and savanna each year. “The burning clears fire-intolerant trees and other woody vegetation, while the native oaks and other fire-tolerant species remain and thrive,” Groves explains. The District also uses mechanical removal methods such as cutting and girdling. A principal activity in oak savanna restoration is the ‘daylighting’ of oaks, removing trees that are crowding out the oaks. “When you let in some light, you never know what will pop up – baby oak trees, shrubs, flowers, ferns,” Groves says. Blackhawk Springs, Oak Ridge, Seward Bluffs and Severson Dells forest preserves all contain examples of successful daylighting. Crews have taken out invasive species including boxelder, cherry and honeysuckle. Clearing the intermediate tree area allows light to penetrate the shrub layer and forest floor. “When we clear, we also plant sedges, grasses and wildflower seeds,” says Groves. The Forest Preserve District buys and plants trees to reforest areas, mostly in savannas. It primarily plants oaks in upland and floodplain areas. Groves proudly notes that his department’s restoration and management strategies are succeeding. Kinnikinnick Creek Conservation Area is the Boone County Conservation District’s (BCCD) best example of successful woodland and savanna restoration. Within the boundary of Kinnikinnick is a 57-acre Illinois Nature Preserve as well as a 45-acre buffer area. The woodland canopy is dominated by white oak, with ironwood, cherry, ash and basswood. The forest floor teems with spring ephemerals in April, May and June. As a result of intensive management, Kinnikinnick’s woodland also has a healthy understory, which is a rarity these days. The upland community gives way to a floodplain forest along Kinnikinnick Creek. It contains black willow, butternut and boxelder. Within the buffer of the nature preserve is a 35-acre savanna that’s been restored over the past three years. The restoration was a cooperative project between BCCD and the INPC. The Wisconsin Driftless Forest, an area of rolling valleys and bluffs in Illinois’ Jo Daviess and Carroll counties, is an outstanding testament to the potential of partnerships among public and private conservation groups. It’s comprised of protected and unprotected public and private woodlands that form the largest contiguous forest in northern Illinois. The only other forests that are this large or larger are found in southern Illinois. It contains U.S. Fish & Wildlife areas, state parks and nature preserves, conservation sites and preserved private land, and is one of the few areas in the Old Northwest Territory large enough to support rare woodland bird species such as Veery, Wood Thrush and the Cerulean Warbler, all on Illinois’ “threatened” list. Invasive fauna pose additional challenges in woodland preservation and restoration. White-tailed deer often kill saplings and small trees by eating the bark and leaves, and by rubbing their antlers against them. Deer have decimated other vegetation in local preserves, too, sometimes destroying vast areas of wildflowers. To minimize the extensive browse damage caused by high-density deer populations, public land preservation agencies in Winnebago, Ogle and Boone counties have cooperated with the Illinois Department of Natural Resources (IDNR) to reduce deer herds in critical areas. Nelson is adamant that responsible stewardship includes wildlife management to keep the ecosystems in balance. “Unfortunately, deer is just one species that threatens the integrity of our native natural areas,” Nelson says. He predicts that the emerald ash borer will have a significant impact on this region’s woodlands, too. Right now, urban forests appear to be the epicenter for this new forest pest and the damaging effects are becoming ever more apparent in communities throughout northern Illinois. As this insect spreads into our remaining woodlands and natural areas, the ecological impact may be very damaging. We can expect to see dead and dying timber on a large scale, where green and white ash trees are common. Such a disturbance will certainly change the structure and composition of these woodland ecosystems for decades to come. Unfortunately, it’s extremely difficult to prevent or treat infected ash trees dispersed throughout the large wooded areas of our forest preserves, state parks and nature preserves. Most agencies find it infeasible to do so. Most people focus on trees when they think of woodlands, but there’s so much more; a tract of trees is not a forest. Boehlke says it’s crucial for anyone interested in preservation to understand that the forest, or any plant community, is an incredibly intricate and delicate system which must be studied and preserved in completeness to be appreciated and valued. Efforts to protect existing woodlands are much more successful than efforts to recreate them. Forests and woodlands are complex systems with various functions happening on multiple structural levels. The canopy, shrub level, ground vegetation and soil all play important roles in a healthy woodland community. Forest organisms have become at least partially dependent upon trees for everything from soil nutrient balance to shelter. Many of our favorite wildlife species, such as songbirds, woodpeckers, owls, gray fox, flying squirrels and spring ephemeral wildflowers, have adapted, over time, to environmental conditions created by the large, light-filtering trees of the forest canopy. When, on a spring walk, tiny Dutchman’s Breeches are seen growing on the forest floor, the proper ant must be present to disperse its seeds throughout the woodland soil. These seeds have tiny, sugary-sweet growths on their exteriors that entice ants to carry the seeds to their lairs and thereby spread the seeds. As this example illustrates, there is much more to understanding the forest than simply seeing its trees. This natural area features a .75-mile stretch of the Pecatonica River, flanked by floodplain forest of silver maple and ash. To the east is a hillside with second-growth, dry-to-mesic forest with white oak near the ridge top and red oak, black cherry, black walnut and sugar maple sloping down to the river. This beautiful 52-acre park consists of a mixed-oak woods, an oak savanna and wetlands. It features an oak savanna restoration project. A spring walk along the interpretive trail offers early woodland wildflowers such as mayapple, rue anemone, Dutchman’s breeches and Jack-in-the-pulpit. 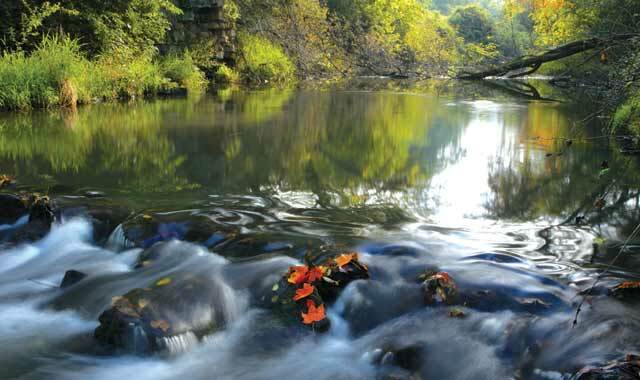 This 2,734-acre property includes a lowland hardwood forest in the floodplain of the meandering Sugar River. Large silver maples, swamp white oaks and green ash dominate the diverse canopy of this wet-mesic forest. Other tree species are shagbark hickory, hackberry, cottonwood, bitternut hickory, bur oak, American elm and basswood. At the northern limit of their range, sycamores are present; black willows are common along the river. This 429-acre area is a remnant forest and oak savanna. White oak, hickory and basswood prevail on the ridges, while willow and maple trees dominate area creek sides. Woodland wildlife is abundant. Located high on a dolomite ridge above the Mississippi River, six native plant communities survive: sand hill prairie, dry dolomite prairie, dolomite cliff, dry-mesic, mesic upland forests and seep springs. Large forests and moister areas add to the unique diversity. White, black and red oak, basswood and sugar maple are among canopy species, with several rare wildflower species. Wooded ravines provide a brilliant color display in autumn. In the park’s northern region are stands of white birch. This is considered one of the best spots to see spring woodland wildflowers in Illinois. The white trillium and bluebells in May are stunning. This is an excellent place to see upland forests on a rugged bluff overlooking the Mississippi River and native hill prairies. This 85-acre land reserve is a good example of an Oak savanna. Wildflowers include birdfoot violets and native columbine. Historically called Sinnissippi Forest, this beautiful 2,291-acre wooded area features limestone bluffs stretching along 3.5 miles of riverfront forested with hardwood and pine trees. This site contains the 686-acre George B. Fell Nature Preserve, with additional surrounding forested areas, including a small floodplain forest along the Rock River. Severson Dells is 369 acres of woodland, prairie, stream and dolomite cliffs. Its closed canopy forest is easily explored on paved and dirt trails and it has a nature education center. This is a prime example of a high-quality, closed-canopy forest. The array of unusual plants includes Canada yew, Chinquapin oak and the only remaining native white pines in Winnebago County. This is a private preserve and access is by permission only, or during special events for the public. See www.naturalland.org for public event info. These 630 acres are heavily wooded and are the location of an extensive oak savanna restoration on the north side. It has dry upland forest with large oaks, ironwood and hickory on the south side of the river. This 653-acre preserve contains a prime example of oak savanna near the entrance. Impressive old bur oaks atop a grassy knoll offer a very rare native woodland landscape. Along the Kishwaukee River are many acres of floodplain forest carpeted with Virginia bluebells in spring. These 142 acres exemplify the last remnants of the original bottomland forest in the Pecatonica River valley. The site is being restored and managed by the NLI. This is a private preserve and access is by permission only, or during special events for the public. Go to www.naturalland.org for public event info. This entry was posted on Tuesday, October 30th, 2012 at 11:59 am	and is filed under Features, Top Posts. You can follow any responses to this entry through the RSS 2.0 feed. Both comments and pings are currently closed.